Rococco Floral tapestry is based on the Gobelins tapestries created for Eugenie, wife of Napolean the third, to decorate her bedroom at the Elysee Palace. The originals were created by the famous Manufacture des Gobelins. Here we see a glorious design of a pedestal of flowers standing wall, with a gorgeously elaborate setting of architectural structures and details decorated throughout with flowers and foliage motifs, to create a tapestry that shows the full extravagance that a portiere tapestry can bring. This wonderful piece shows the unique beauty that a piece based on the works of the Gobelins tapestry manufactory in 17th and 18th century France. This piece is a companion piece to "Rococco Statue". 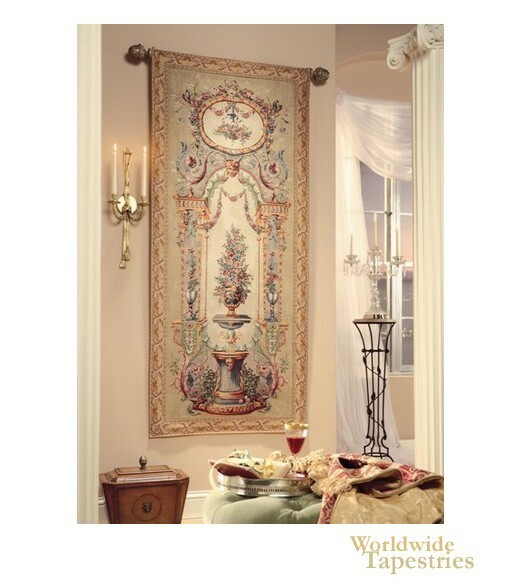 Full of beauty, this French tapestry "Rococco Floral" is backed with a lining and has a tunnel for easy hanging. Note: tapestry rod, where pictured, is not included in the price. Dimensions: W 35" x H 77"